This piece offers suggestions based on some things we expected to learn and from some things we did not expect to learn about communicating research to congressional policymakers. Some of these are insider discoveries from working as a professional staff member for a joint committee of the US Senate and the US House of Representatives. Other things we learned came largely as surprises from attempts to provide basic information and issue awareness about socioeconomic conditions in the Southern Black Belt directly to the Congress as well as indirectly through public interest and grassroots groups. One of the surprising discoveries, working professionally both on the inside of Congress and on the outside as social scientists, is how well social interaction actually works. And there were other surprises as well. 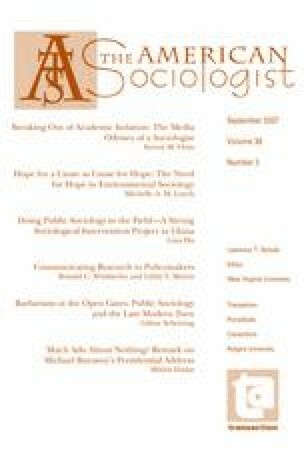 This article is based on an August 16 panel presentation by the first author at the 2003 meeting of the American Sociological Association in Atlanta. The panel was organized by Larry Burmeister of the University of Kentucky. Material written in the first person singular in the first section of this article, “From the Inside,” is from the first author’s experiences. Later, portions of the text beginning with the subhead, “On the Outside,” and stated in the first person plural are by both authors.